Sixty (2017) Robert Browning. 2 1/2 by 1 1/2 inches. Accordion, wooden covers, printed with wood type. Sixty copies made for Donna's birthday. $60. 55 (2012) John Muir. 2 ½ by 1 ½ inches. A quote about going to the mountains, for Donna’s 55th birthday. 55 copies. $55. Click here for more images and information. Tree (2012) John Muir. 3 by 2 ¼ inches. 11 page accordion book. 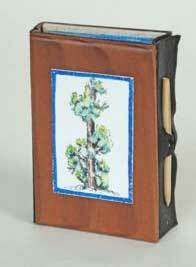 Eight watercolors of trees in a flag accordion style binding with wood covers. 100 copies. Winner of the 2013 Miniature Book Society Distinguished Book Award. $75. Click here for more images and information. Song of the Open Road (2011) Walt Whitman. 3 by 3 inches. The text is the first stanza of Whitmans' poem, letterpress printed with Goudy 30 type. Eight watercolor paintings of gypsy caravans. Accordion-folded, modified piano hinge binding. 150 copies. A Gipsy Caravan (2010) The text is by Kenneth Grahame from “Wind in the Willows”. Watercolor illustrations and Donna's calligraphy. 2 5/8” x 2 1/8”. 26 pages. 150 copies. Beauty (2009). Text is a quote by John Muir. 10 illustrations of Sierra berries. 2 7/8 x 2 1/2 inches. 100 copies. Glen Dawson (2008). A timeline biography of the respected bookseller. 1 5/8 by 2 15/16 inches. 14 accordion pages. 65 copies. $50. Click here for more images and information. Train Depots (2008). Text by Peter Thomas about the history of train depots in the U.S. 9 line drawing illustrations of train depots. 2 1/8 x 3 inches. 44 pages. 85 copies. $75. Click here for more images and information. 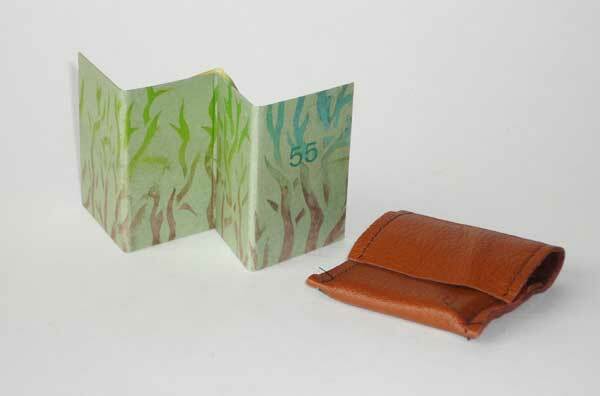 Miniature Leaf Books (2005). 2 7/8 by 2 1/4inches. 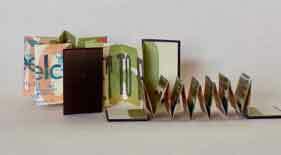 Text about the history of miniature leaf books. 30 pages. 126 copies. Love is Everlasting. (2003) 1 1/4 by 1 5/16 inches. A traditional Hawaiian proverb.10 accordion pages. 100 copies. Half Dome - A Climbing History (2000). Donna Thomas. A story about Yosemites Half Dome, its discovery and first ascents, is told in a footnoted text. Two black and five 3 color block print illustrations by Donna. Hand set, letterpress printed on Peters handmade paper. Coptic bound with redwood boards. 3 by 2 1/4 inches. 32 pages. 130 copies. $75. Click here for more images and information. Song of Creation (1999). John Muir. Muirs quote is illustrated with a 180 degree panoramic view of Yosemite Valley. 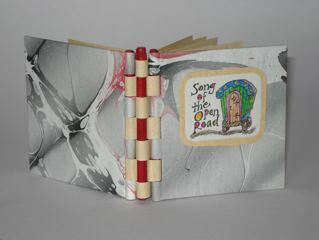 Donnas original watercolor illustration is color copied on Peters handmade paper and bound in a unique double pop-up accordion. 2 3/4 by 2 1/8. 500 copies. Click on image A Story of Life (1994). Peter Thomas. A fairytale/myth about a womans triumph as she claimed the truths she discovered in life. 5 lino cuts by Donna. 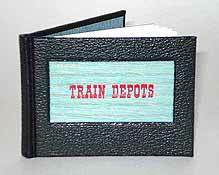 Quarter bound, gold stamped leather spine. 1994 MBS Distinguished Book Award winner. 2 1/16 by 1 3/8 inches. 32 pages. 200 copies. $75. Click on image The Divine Plan (1993). Glenn Clark. Clark was a remarkable individual who, in the 1930s, founded a series of spiritual retreats called the Camps Farthest Out or CFO. This book shares Clarks inspired vision of how to recognize Gods divine plan at work in one's life. 2 1/2 by 1 7/8 inches. 30 pages. 200 copies. $50. Click on image An Aesops Fable: The Donkey & the Thistle (1993). The second book by Tanya & Suzanne's Just For Fun Press. The traditional story has been retold and handset by Tanya and illustrated by Suzanne. 3 by 2 1/2 inches. 12 pages. 175 copies copies. 1-25 $ 60.00, 26-175 $40. Click on image Novel: A Poem (1993). Fred Moromarco. Made as a collaboration between the Greenhouse Review Press & The Good Book Press. A compelling autobiographical poem written in a format which cleverly parodies a traditional novel. 2 3/4 by 2 inches. 80 pages. 150 copies. $80. As with many fine novels, this book has been remaindered. Reduced price $40. Good Books - A Bibliography of the Books Made by Peter and Donna Thomas: 1978-1991 (1992). Peter and Donna Thomas. 2 3/4 by 2 inches. 112 pages. 200 copies. $75. Click on image Pretty Rocks (1991). Suzanne Thomas. 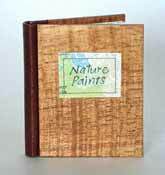 This book is the miniature reproduction of a manuscript book by Suzanne Thomas (age 6). Using phonetic spellings, Suzanne tells a story of an angel taking a walk to find pretty rocks. 1992 MBS Distinguished Book Award winner. 2 15/16 by 2 1/8 inches. 12 pages. 150 copies. $75. Edition sold out. Click on image The First Christmas Story (1988). The King James Version of the Bible. This is the story of the birth of Christ taken from the gospel according to Luke. 2 5/8 by 1 15/16 inches. 32 pages. 200 copies. $75. Click on image Two Sisters (1986). Peter and Tanya Thomas. A bedtime story told to Tanya to help her understand and deal with the fact that her sister was in the hospital. 3 by 2 1/4 inches. 20 pp. 200 copies. No copies currently available. Edition never completed. Click on image I Love You (1985). A book designed to convey amorous sentiments by using the words I Love You and a heart-shaped printers ornament.1 5/16 by 15/16 inches. 4 pages. Not a limited edition. $25. Click on image Drop Dead (1987). Printed with the words Drop Dead and a skull and crossbones printers ornament.1 5/16 by 15/16 inches. 4 pages. Not a limited edition. $25. Click on image Shakespearian Words of Gratitude (1991). William Shakespeare. Text says, Thank You! - Hamlet Act II, 2:273. 1 5/16 by 15/16 inches. 4 pages. Not a limited edition. $25. Click on image Good Luck (2002). Printed with the words Good Luck and a four leaf clover printers ornament. 1 5/16 by 15/16 inches. 4 pages. Not a limited edition. $25. Click on image Happy Birthday (2002). Printed with the words Happy Birthday and a birthday cake printers ornament. 1 5/16 by 15/16 inches. 4 pages. Not a limited edition. $25. Click on image Book earrings, pins, stick pins and hat pins. This jewelry is made with miniature blank book that have blank pages made with Peter's handmade paper and covers made with marbled paper. The ear wires are hypo-alergenic surgical steel. Any color, just specify. $11-$27, see link page for prices. Cruces (2013) Georgia O'keeffe. 3 by 2 1/4 inches. Match book like format with fold-out page that is in the shape of a cross, printed with 3 color reduction cut prints. 20 copies.
. Click here for more information. Note: This book is slightly too large to be considered a miniature book by the MBS. Eighth Grade (1998). Suzanne Thomas. Suzanne wrote and illustrated (8 pencil drawings) this short essay on school and homework. She letterpress printed it on Peters handmade paper with handset type and it is ruled with blue and red lines like school paper. Bound by Suzanne to look like a composition book.1 5/8 by 2 3/8 inches. 75 copies. Sold Out. Sold Out. Click here for more images and information. The Southwest (2010). Donna Thomas. 2 1/4 by 1 3/4 inches. 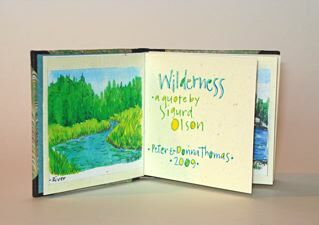 This book is a series of watercolor paintings of landscapes that Donna painted in National Parks we passed through in the Southwest during our wandering book artist's gypsy wagon trip in April and May of 2010. 16 accordion pages. 50 copies. Nature Paints (2008). Text is a quote by Ralph Waldo Emerson. 2 3/16 x 1 7/8 inches. 18 pages. 4 double-spread watercolors of Sierra scenes. 50 copies. Wilderness (2009) The text is a quote by Sigurd Olson, the John Muir of the Boundry Water. Watercolors painted on site in the Boundary Waters National Park, MN. 3 by 3 inches. 50 copies. $75.sold outClick here for more images and information.